This document was compiled a number of years ago, perhaps when SAS first came into being way back in the early 1980’s. Though it is a number of years old, there is a lot of useful and helpful information for those considering building their own observatory. There is also a CD which shows some colour images. After becoming interested in astronomy, most amateurs purchase or build a telescope and commence observing, usually from their backyards. Few amateurs need to be reminded of the recurring frustrations of setting up, packing away, dew, wind, mosquitoes, neighbouring house lights and general lack conveniences when observing out in the open. Serious observers soon contemplate the construction of an observatory, when a site is available, to overcome these problems. Should I build an observatory in the suburbs or look for a country site? Can I build it myself? Which design would be the best for my needs? How can I encourage my wife’s or parents’ approval? How can I stop it from looking like an outhouse without spending heavily? Will it have any resale value if I sell? 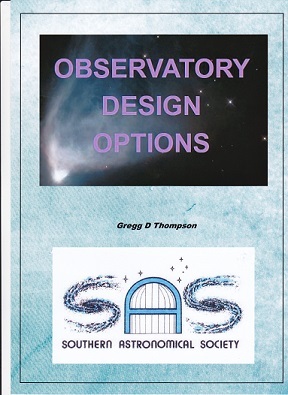 These are the important considerations when designing a practical observatory. It is the aim of this paper to offer some possible answers to these questions by suggesting some alternative variations on the more conventional roll-off roof observatory deign, in the hope that a more functional design may be achieved within a modest budget.